I’ve always said what I love about online sports betting is the ease of placing a bet online. Placing a sports bet online means you never have to leave your home in order to place a bet on your favourite sport. No more travelling to your sports betting agency (TAB). No more phone calls to them or to your bookie. What makes placing your sports bet online even easier is the sports betting app made available by the best online sports betting agencies. The question is which is the best sports betting app? As my regular readers know I have joined 3 online sports betting sites and I’ll be giving you my personal opinion of who has the best sports betting app. Those sports betting sites are, Sportsbet, Bet365 and Sportingbet . All three sites offer great sports betting apps and your opinion as to which one is the best sports betting app may differ from mine. Let’s consider aesthetics first. The image above shows a screenshot of each of the apps reviewed in this post. The first one is obviously bet365, then we have Sportsbet and finally Sportingbet. When it comes to the way something looks it’s always a matter of personal opinion. Before joining Sportsbet Sportingbet always appealed to me more. Now that I’ve joined Sportsbet, which has a similar look to Sportingbet, its pretty well a tossup between the two. After giving it some thought I’ve decided that Sportingbet is the best looking app. I find that bet365 has too much information on the home screen causing me to scroll down a lot to get it all in. While Sportbet isn’t as bad I still had to scroll down a fair bit. I found Sportingbet’s homepage to be the most concise and best looking homepage. It allows the user to select the sport they’re interested in easily by selecting the corresponding tab. This is probably the most important aspect of any good sports betting app. When anyone downloads any app they expect it to make things easier for them. So, in order to gauge which app is the easiest I used each one in turn to see which one has the least amount of steps from the home page to place a bet on this weeks AFL final. Both bet365 and Sportsbet created bet slips which I feel is an unnecessary step. If it wasn’t for the bet slip they would have saved a step. Both Sportsbet and Sportingbet allows the user to select predefined betting amounts whereas with bet365 you had to input the required amount. 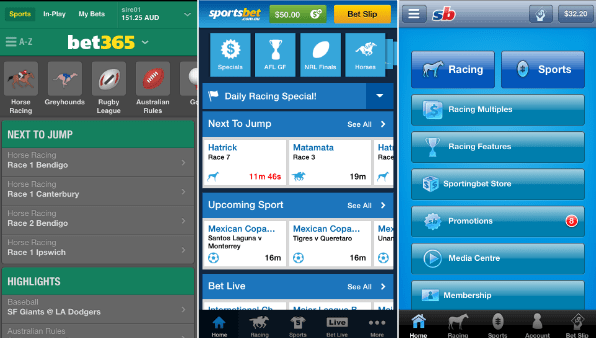 After using all three apps, even though each one involved 6 steps, I found the Sportsbet app to be the easiest one to use. It required less thought and was the simplest one to navigate. Here is a video I made that show how easy it is to place a bet using Sportingbet. All three apps offer several ways to deposit money. Bet365: Credit Card, Neteller, PayPal, Skrill, iDebit, Click2Pay,Ukash, paysafecard, BPay,POLi,Wire Transfer, Fast Bank Transfer and Cheque. As fars as payment options go bet365 definitely offers the most options, so if that is important to you then your best sporting app would have to be bet365. They all offer PayPal which to me is a must. Overall I’ve found each of the apps to be very good. As I’ve said in previous posts it important to have more than one option when it comes to placing a bet online. There are several reasons for this. One is that it allows you to get the best odds possible. The other and more important one is that it you never know when one site may be offline. This can be most annoying when placing a bet. At least when you have more than one online sports betting membership if one is down you can always place a bet with the other one. Another good point is that each site occasionally comes up with special promotions. Sportingbet does this a lot. Having joined 3 of the best online sports betting site I can take advantage of more offers than punters who have only joined one site. The Best Sports Betting App Is…….. It was a close call between Sportingbet and Sportsbet but the winner of the Best Sports Betting App, by a nose, is Sportsbet! Do you have a favourite sports betting app? In your opinion, which is the best Sports Betting App.